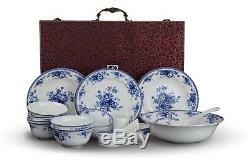 28-piece Bone China Blue and White Dinnerware Set, Service for 6, Rice Bowl S.. Color:blue and white The premium set comes with 28 pieces of bone china dinnerware. It is shinning like jade, with elegant touch of tradition. 28 Pieces of fine dinnerware set: 6 8" plate(2 shallow, 4 deep), 6 4.5" bowl, 6 4" saucer, 6 4.75" spoon, 1 9" soup bowl, 1 8.25" tablespoon, 1 4" ashtray, 1 3.25" toothpick holder. Made in Jingdezhen, capital of porcelain in China. Packed in a brocade box. Product Dimensions: 18 x 14.5 x 7.5 inches. Item Weight: 14.9 pounds. The item "28-piece Bone China Blue and White Dinnerware Set, Service for 6, Rice Bowl S" is in sale since Saturday, June 23, 2018. This item is in the category "Home & Garden\Kitchen, Dining & Bar\Dinnerware & Serving Dishes\Dinner Service Sets". The seller is "festcool" and is located in US. This item can be shipped to United States.